Are you thinking of replacing your existing shed door? Maybe you’ve thought of building one yourself? When I first started out, I had no idea how to build a shed door. You’d think it was simple, but there’s a lot that goes into it. If I knew then what I know now, I could have saved myself a lot of mishaps. If you want to create your own, but you aren’t sure where to start, check out these thirty-one shed door design ideas! The first item on our list of shed door ideas is from Ana White. She’s given step-by-step instructions on how to build this super cute barn door. She’s also included a detailed plans and list of the tools you’ll need to complete the project. What I like about Ana White’s door designs is that she portrayed this door in a variety of colors! It makes it so much easier to picture it installed in your own shed or barn. Shed door designs like the one for this door are pretty interesting. Instead of the common X shape on the lower half of the door, this one has a sort of “ray” effect. The helpful YouTube video lays it all out in simple terms for you. It doesn’t take much time or effort to put together. You’ll want to know your way around a cutting tool (like a circular saw) to build it, but that’s about it. A board and batten door doesn’t use plywood. Instead, you’ll use slats of solid wood for your base. And you’ll still get that neat “ray” effect we mentioned in the last design. It’s a lot more sturdy than the plywood-based doors we covered already. Better still, even a beginner can put it together! This design gets a win because it not only tells you the “how,” but also the “why” behind every step and component. Sometimes people combine a couple of great shed door ideas into one awesome door. This is one of those times. This door from TwoFeetFirst has some of the same strength as a board-and-batten shed door, but with a bit of a cheat. If you’re looking for something unique that doesn’t take a lot of effort, then this is a great fit for you. They give you some helpful tips on how to prepare the wood and offer photos for every step of the process. This one shows you how to use your T1-11 exterior siding to create a seamless style shed door. This is an effective way to maintain continuity and to save on material cost. For this door, you’ll need to be a little more handy if you’re adding a brand new opening. The good news is that you can actually insert the door between two studs when using T1-11 siding. Half the work is done for you! If text bores you, this door design does most of its instruction via pictures. This is another example of using T1-11 exterior siding to help your door match the rest of the shed. For this one, you build the door frame and then affix the plywood boards and siding to each side of the frame. If you want a lightweight (hollow) door, then this is perfect! BuildEazy has an in-depth tutorial that covers everything from jargon words to measurements. Does it sound complicated? It’s not. They actually explain it well enough that a total novice can understand the steps. I like that they use diagrams and also explain carpenter terms as they use them in the text. It’s refreshing to not have to Google every other word! This one gives you some great tips on how to increase stability. One of these tips is to use double studs on either side of the door rough opening. This design also touches on the use of cripple studs! The included plans and diagrams break down all the individual components of a shed, as well. It’s a great starting point for an overview of what lies ahead. This article also provides a few useful tips that could save you some time. The design for this shed door is pretty straightforward. What I like about it is that it not only shows me how to build a single shed door but also a double. The instructions are uncluttered, telling readers in the simplest possible way how to perform each step in the process. I like their use of diagrams as they explain the steps. Too often, I feel like I’ve missed a step when I look at a picture that proceeds an instruction. Not so with this design! ShedKing is brilliant at explaining their process. They avoid complicated jargon and provide detailed photos and diagrams, making everything easier. They also point out common problems you might run into and offer preventative advice. One such piece of advice that I really liked was “overlap.” The tip is to leave one-and-a-half to two inches of the extra panel that extends past the floor sheeting. Doing this provides additional weatherproofing! Do you know which wall you plan to install the shed door? This is actually more important than you think. Installing it on the gable side instead of the sidewall requires different planning. This article explained all of that really well, and then some. What I liked most about it was that it laid out every detail without sounding repetitive. Which is great, because repetition turns me off of reading instructions. Remodelaholic offers an excellent door design in a fun and upbeat tone. This one is a Dutch door, meaning that the top and bottom halves operate as separate units! It’s a super cool idea and I like how they used this door type as a baby gate to the stairs. For your shed, you could use it to keep your pets from entering while still enjoying a comfortable breeze. The best part is how detailed and clear the instructions are. You definitely cannot go wrong. This is another Dutch door, but what I like about this one is its list. You won’t have to pick through the article to find out what materials you need. It’s all laid out for you toward the beginning of the article. In fact, you could probably just print it out and head to the hardware store! Super convenient! This article actually gives you some ideas into shortcuts to make a Dutch door. For example, using an existing door or purchasing a kit! This door design from Barn Toolbox is nice because it gives you everything in a neat PDF plans. The style of the door itself is much higher quality than the other Dutch doors we’ve already seen. The PDF file is straightforward; no flowery language at all. It gives you the material list, the blueprints, and the step-by-step guide. Everything in the file is necessary. It’s four pages long. It would be easy to print it out and keep it on your workbench for reference. There is a picture of this DIYer performing every task to construct his shed door design. With captions beside everyone, explaining exactly what is happening. As if that’s not enough, he even includes a video at the end! The doors themselves look amazing! They’re so seamless; you wouldn’t even know the doors were there if you weren’t looking for them. It’s an excellent project. But you’ll definitely need to be a little handy for some of the steps he shows you. Want to build some new doors for your motorcycle storage shed to get easily in and out from it, but you’re on a budget? No problem! This door design has a budget of under one hundred bucks! The step-by-step guide is easy to follow, too. All you’ll need is a Kreg Jig, circular saw, sander, and a drill. It’s not a difficult project, but a basic understanding of how to operate these tools will be helpful. If all else fails, there’s a video that demonstrates every step for you! #17 Shed Door Design? Check! This step-by-step DIY guide is awesome. It tells you exactly what materials you’ll need as well as all tools necessary to the project. They’re all in list form, so you can print it off and do a checklist before you start! This single shed door design should only take you about one day, according to the article. The instructions and diagrams do make it simple to understand. As long as you know your way around the tools, you shouldn’t run into any problems. This sturdy design from A Concord Carpenter originated from Sandra Stout (Creative Designs.) Tongue and groove have many benefits, one of which being that the boards are less likely to separate. In regular board and batten, it may develop gaps over time. It might take some extra time to build this door type, but it looks stunning when it’s complete. The instructions are a bit sparse. Someone experienced in DIY projects like these shouldn’t have any problem, though. This YouTube video shows you from start to finish how to build and hang a set of double shed doors. It runs about fifteen minutes long and takes you from the raw materials to the finished product. The only thing I don’t like about this tutorial is that the instructions aren’t available in text. This makes it inconvenient to follow along when actually building the project. If you plan to use this instructional video, prepare to take notes beforehand. Otherwise, you’ll need to pause the video between steps. For some great tips on how to build a set of double shed doors that are more weatherproof, check out this tutorial. This DIYer thinks of everything. She gave her double doors an overhanging “lip” and also even thought about insulation. She actually forgot to include the insulation in her own doors, she was so excited to build the project. The instructions she’s included are easy and fun to follow. She supplies many pictures to assist in the building process for others. Trial and error is the overarching plot of this tutorial. When they removed their shed’s asbestos boards, it rendered their shed doors unusable. To be fair, they were old and already rotting. The result was an odd-sized rough opening that required custom doors. The DIYer documented his journey and showed us how he built a set of replacement double Dutch doors. Despite his mistakes, his instructions are serviceable. He points out where he went wrong and offered tips to make the project run smoother for others. If you want to learn how to build a large barn door while also getting a laugh, DIY Diva’s got you covered! Between her misadventures with her donkeys and a carpenter bee, the project went on. She provides pictures along with her instructions, though some of them are of her donkeys. She’s a sarcastic instructor and makes the project’s process sound like a lot of fun. Also, she understands the need for a budget, detailing how she managed to reuse her old barn hardware. #23 Double Shed Door Design? Double Check! From the same DIYer in Number 17, he now shows you how to construct a set of double doors. As with his instructions in 17, he provides lists of materials and tools necessary to the project. The double door project should also only take someone about a day to complete. Less experienced carpenters may take a bit longer to complete the steps as they learn the tools. As with 17, this tutorial also supplies detailed diagrams that are easy to understand. “Concise” and “easy to understand” were the first things that popped into my head when I opened this PDF file. The first page is the material list, making it easy to ensure that you have all the items you need before starting. Then, it goes straight to Step One. Every page is a step and every page not only includes a text description but a clear diagram. This is one of the most print-friendly instructions of how to build double shed doors. Pine Doors building video from Wes Hamstra. This video is a great shed door walk through guide which shows you the process of building amazingly looking doors from cutting the boards to hanging them to his gorgeous shed. He uses Kreg concealed fastening system for strong wood to wood joints and great hidden fastener end result. These barn doors will add interesting character to your shed. They look ancient and rustic. I like the “no fastener” look. On a side note, detailed list of the materials, fasteners, lumber dimensions, etc. would be useful. Darbin is all about perfection. She is very handy with all kind of tools – chisel, circular saw, router, planner. I love her red barn style door with gorgeous large hinges. It is built from 2 panels of glued custom made T&G boards. This set of sliding double barn doors uses the board and batten style we’ve already covered a couple of other times. The instructor supplied several videos and pictures of the process. It shouldn’t be too difficult to replicate. When building this project, save yourself some time by buying quality wood. The DIYer mentioned that the knots were hard to cover with paint. The writer also mentioned that she had to fill gaps between the boards with caulk, so be on the lookout for that. The Barn Toolbox brings subtle details to your attention, helping you avoid frustration. The tutorial is for a double sliding barn door, but it also advises you on wood type and quality. There are a lot of pictures to help you along as you follow the steps. As long as you’re already handy with these types of DIY projects, though, you shouldn’t run into any trouble. Want a cute barn door, but don’t want to pay out the nose? Remington Avenue has a great tutorial for a project under fifty bucks! The instructions are easy to understand and they’re supplemented with images! What’s more, the blogger struck a deal with The Barn Door Hardware Store to give her readers 10% off all hardware! The only thing I don’t like about this tutorial is that they don’t provide the materials in list form. This article is not about building a door but all about how to make a sliding mechanism fabricated from and skateboard wheels and bearings. Finished sliding hardware cost was a grand total of $95. Not cheap, but well under the cost of any most affordable commercial sliders. Make any door from above, add these sliders and your shed will look amazingly. Did you enjoy this list? I love sharing my shed door finds with others. It’s a great feeling to know that I’m helping people avoid frustration with their DIY projects. Building a door for your shed should be a fun experience! 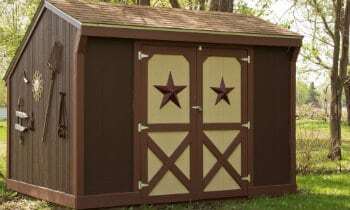 What did you think about this list of shed door plans and ideas? Is there anything you would have added? Let us know in the comments! And, if you liked this list, be sure to share it with your friends! Wonderful wonderful ideas and help. Thank you so much for your help (without you specifically knowing).